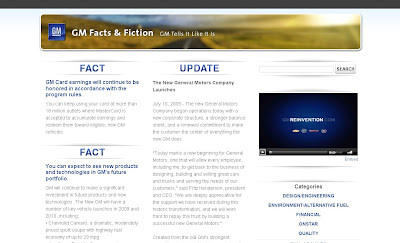 As GM emerged from bankruptcy yesterday, the event was trumpeted on company websites, such as GM Facts and Fiction (above) and GM Reinvention (below). 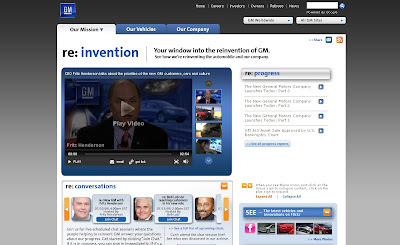 Of course, one of the areas that the company is not reinventing is the bricks and mortar dealership model, which has had a long history of discriminatory pricing against women and people of color that -- as a taxpayer who helped fund bailout initiatives for the GM corporation -- I am less than enthusiastic about seeing endure, particularly at a time when Internet shopping for everything from real estate to jewelry to international travel has transformed existing economic models. The main issue for me is pricing. Yes, no virtual reality simulator can ever take the place of a test drive, but those buildings full of bullying salesmen don't need to be maintained at their present sizes. Speaking to NPR, GM executive Bob Lutz elaborated upon what he saw as the corporation's online options. GM has been testing a program of selling autos online on eBay in California. Some have asked whether this is a new paradigm that will rely less on traditional dealerships. "All of these online experiments will purely be for the customer to make her pre-selection of the car — and ultimately that vehicle will still be delivered by a dealer," Lutz says. "There is no model which can legally permit automobile companies to sell directly to the customer." The Internet doesn't permit the full range of a sale, he says, especially that ability to allow a dealer to see a used car that a customer may want to trade in. Across the world, he says, "the franchised individual automotive independent retailer is the way to go; it's the model that works best." Lutz even ridiculed other options by saying "every 10 or 15 years some genius invents a system that's gonna eliminate car dealers." Speaking as a consumer, I would much rather see transparent and fair pricing instead of the e-Bay model. As a conservative consumer, the thrill of possibility getting a steal isn't worth the risk of being gouged with elevated impulse buying, and the hope is clearly that auctions will jack up prices rather than have efficient targeting marketing lower them, as the Amazon paradigm would have it. Part of why I've been a driver of a Honda Accord for the past twenty years is that I hate participating in this masculinist gamesmanship. I'll test drive it and then get out of the dealership as quickly as possible, and then I'll leave my middle-aged white male husband to negotiate a cheaper price than I ever could. I resent subsidizing an industry that profits on discrimination and deception and would rather see fair pricing at work. According to the New York Times, eBay is denying that there is an partnership with GM. You can't blame them for not wanting to be associated with a failed brand. Let me state up front that I like to haggle and bargain over prices and features. I also know, whether one enjoys it or not, that haggling is a learned skill, not a trait, since I learned this skill, as a child, on the border, where every transaction is considered negotiable until it's not. So, I am not sure that a sales model which relies on such haggling and bargaining is equivalent to discriminatory pricing against women and people of color. Are you suggesting that, on the whole, women and people of color can't haggle? What else can't they do? Math? I am kind of surprised at the gist of this post. Maybe I misunderstand you. Who Doesn't Love Virtual Currency?